Seeing the stuffed animal that is about to trip my daughter as she's walking backwards. Picking up the shirt my son left on the floor as he's running around dancing because hardwood floors and cloth of any kind, don't mix. That type of stuff. Inevitably, I find myself consistnetly planning, predicting and trying to prevent. But this only strikes me in moments of solitude. I also realized I adapt relatively well to chaos, maybe even thrive on it subconciously. In a way it drives and motivates me to keep moving to get things done. After all, that's what I know 95% of the time. This recipe was created on a day when things were nothing short of chaos. But I was determined to make it despite the madness around me, and hoped it would turn out as I had envisioned. Sure enough it did. It's a simple recipe that can easily be made in the bustle of Thanksgiving. 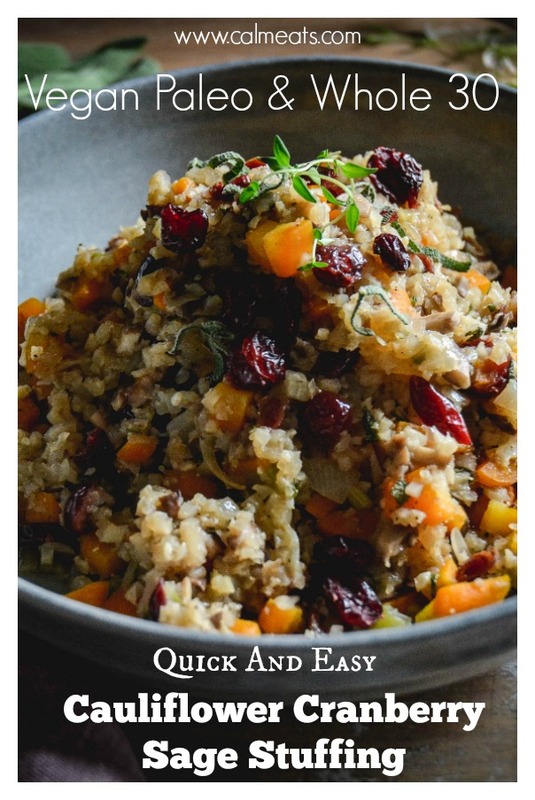 My suggestion would be to make your caulirice ahead as it will save you a good amount of time. Here are instructions for how to do it. If you're really strapped for time, you can always get frozen. Yes, I know...I love it too. But truly there's not much to stress over. It's cutting up a bunch of veggies and herbs and tossing them with cauliflower. 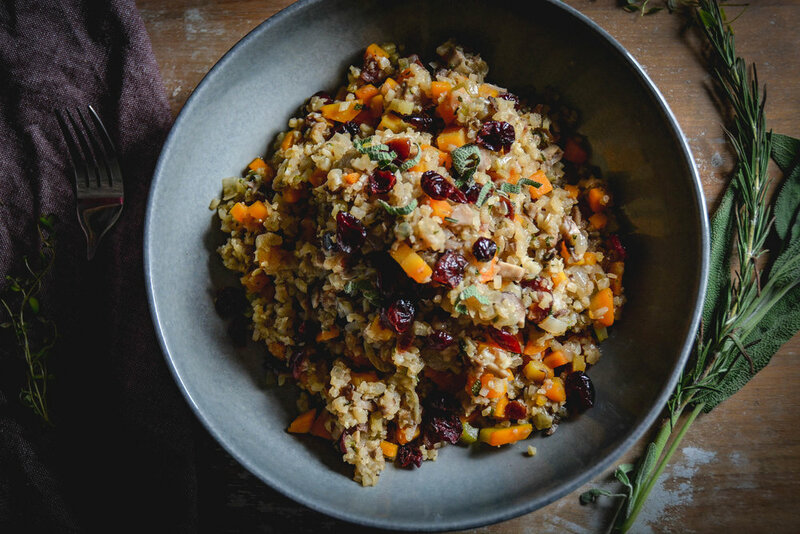 If you're following a paleo way of eating or are gluten free, this is going to be a nice alternative for your Thanksgiving table. 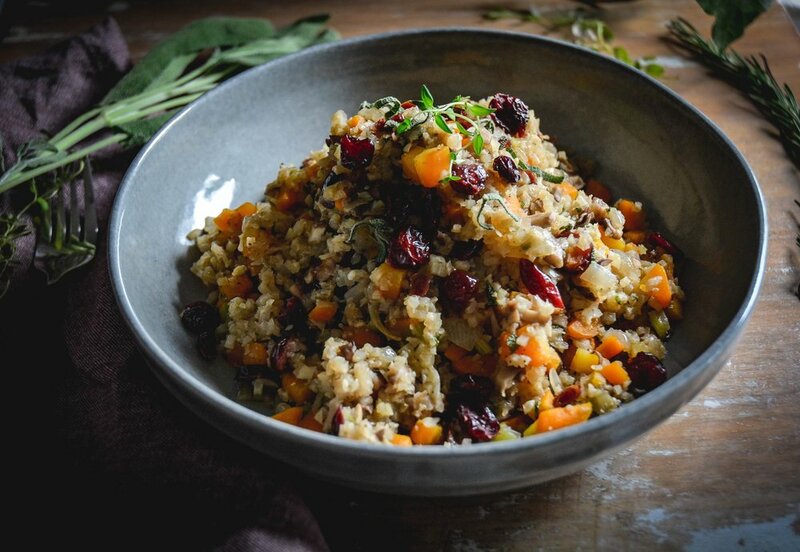 The vegetables work exceptionally well with the sweetness of the cranberries and the earthy taste of sage. It will not disappoint. *If you're cooking for a larger group, double up on the recipe. Heat pan on medium. Add olive oil, carrots, celery, onion, 1/4 tsp salt and cook until veggies are soft - about 6-8 minutes. Next add mushrooms, caulirice, herbs and cranberries. Cook for 2 minutes until incorporated. Add broth and simmer for 15 minutes until all vegetables have softened. Add cranberries and serve right away.